"I have a message that I constantly deliver to those who attend my golf shows. And I say it to one and all, whether they have golf experience or not. 'Never give up,' I tell them. 'Never, ever give up.' Never give up on YOUR dream!" is now available in PDF format! Now you can take the inspirational autobiography of Dennis Walters and read it everywhere! For the first time ever, Dennis’ amazing story is available in PDF format for only $9.99! Plus, with the eBook version, you get exclusive access to video links, embedded media, and a bonus photo album only available here! And, the best part is that as an owner of this eBook, you'll get free updates for the life of the eBook! Every quarter, you'll receive an email notification letting you know that new content has been added and you will be provided with a link to download the new copy! For such a low price, you get the book that never ends! This is an amazing deal and an incredible opportunity to become inspired today! Dennis’ message about never giving up on your dreams reads even more beautifully in this wonderful PDF. "I have a message that I constantly deliver to those who attend my golf shows. And I say it to one and all, whether they have golf experience or not. 'Never give up,' I tell them. 'Never, ever give up.' Never give up on YOUR dream! And if for some reason that dream doesn't work, get a New dream." Whether you have seen one of Dennis' motivational shows or even if you have already own the hard copy, this eBook is a must! You will be inspired by his journey! Learn why Dennis' story earned him a place in history with awards such as the 2008 PGA DISTINGUISHED SERVICE AWARD WINNER, Honorary Lifetime Member of the PGA, Ben Hogan Award, Graffis Award, The Mary Bea Porter Award, and many more listed here! 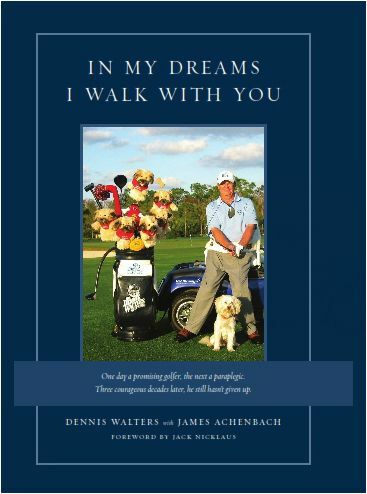 Read about how Dennis' story has inspired golf greats such as Jack Nicklaus, Arnold Palmer, Gary Player, Tiger Woods, and more! Take Dennis' incredible message with you no matter where you are!